We’d love your help. 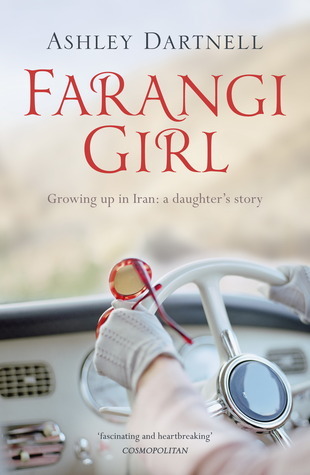 Let us know what’s wrong with this preview of Farangi Girl Growing Up in Iran by Ashley Dartnell. To ask other readers questions about Farangi Girl Growing Up in Iran, please sign up. This book was brilliant in so many ways. An insight into a totally wild upbringing in what for me would be an alien culture. Not only is it a story that keeps you hooked but it's beautifully written. If you've any interest in family dynamics this is a wild one. My wife loved it too and was lost to me for the three days it took her to consume it. Fantastic reading. A remarkable childhood. Feels like a lighter - less angst - version of Jeanette Walls' 'The Glass Castle'. I very much enjoyed the book, maybe more so because of living in the Middle East. I have never been the sort of person for a true life story, well other than a child called it. So when I was offered the chance to read this book I wasn't totally sure what I was going to make of it. Would I like it, would I get on with it, or would it challenge my reading limitations. Now however, I can say that I was totally glad that I picked up the book because it didn't have that whole, this is my life and this is my book about me feeling to it. It was more like a story, a film within a sto I have never been the sort of person for a true life story, well other than a child called it. So when I was offered the chance to read this book I wasn't totally sure what I was going to make of it. Would I like it, would I get on with it, or would it challenge my reading limitations. Now however, I can say that I was totally glad that I picked up the book because it didn't have that whole, this is my life and this is my book about me feeling to it. It was more like a story, a film within a story if you life, because for me every page came alive with a different meaning and moral for the reader to learn from, but to also experience. The way in which this book is written certainly keeps you within the grasp of its pages, so that you are never left downplayed or bored. you always find yourself hanging on, going just one more chapter before I put this down and go do whatever it is that I need to do. I think for me the book made me realize just how luck I was as a kid growing up. We all wish that we were princesses, being spoilt rotten with a big fancy house a four poster bed in our bedroom. But this book represented just how hard life can be, that sometimes what we consider our limitations are others treats and dreams. Ashley clearly went through a very challenging past, but through it all you can see that she is a character of great strength and power. Even when life was trying to knock them all down she never appeared to let it phase her for long and she always seemed to be aware of what was happening around her. I think the way that she displays her mother truly allows us to get a real eyesight for what it was that she had to live with. It made me laugh, cry and feel anger at the best of times. I think there may have even be times where I was screaming at the book in the hopes that her mother would listen. In the end though, I found myself feeling a gentle hum of peace for her mum and for ashley herself. I felt a sense of great respect for them both because you could tell that though they were different in many different ways, they were also quite close and similar to one another. The connection they had was beautiful and it really made me feel warmth within my soul. I loved the way that Ashley made the pages come alive within my mind though. I felt I was in iran with her, that I could feel her frustration with the lack of education that she was getting, or the desire to be someone to someone else, or to be something. Every page just seemed to have the joy and passion within it that all books should have, and that was beautiful. Upon recieving this novel today i am thoroughly excited to begin reading it, as Farangi Girl looks increadible. I cannot thank the author enough for such a lovely message & inscription and i hope that once i have read & reviewed this book, that many readers will sit up and take notice! Farangi Girl was a really heartfelt and insightful story that was very personal to the author and i thoroughly enjoyed reading it. The book is sincere, emotive and heartbreaking, that had me as a concequen Upon recieving this novel today i am thoroughly excited to begin reading it, as Farangi Girl looks increadible. I cannot thank the author enough for such a lovely message & inscription and i hope that once i have read & reviewed this book, that many readers will sit up and take notice! I am currently reading the book. How the author has described her life and feelings is pure and honest, and of course very touching. She must be very blessed as a child to have such a strong soul and character. I have enjoyed every bit of the book I have read so far and have been able to picture it in my mind clearly. As an Iranian, I have also managed to ignor the image of Iran that Ashley has experienced and has introduced to her readers in the book, which is highly affected by the state and t I am currently reading the book. How the author has described her life and feelings is pure and honest, and of course very touching. She must be very blessed as a child to have such a strong soul and character. I have enjoyed every bit of the book I have read so far and have been able to picture it in my mind clearly. As an Iranian, I have also managed to ignor the image of Iran that Ashley has experienced and has introduced to her readers in the book, which is highly affected by the state and the quality of her family life in Iran. The Iran she has described is poor, uncivilised and gross. Of course, with a little research and study, one would find out that Iran, specially before the destructive Islamic Revolution, has always been one of the most advanced and richest countries in the region and the continent. I highly recommend this book, specially to young adults and teenagers, both in order to appreciate their lives and families and, also to be inspired by Ashley's life to develope stronger personalities and character. Although, for any reader who is unfamiliar to Iran, I hope they don't base their judgement on Ashley's experience and picture of Iran. I was really pleased when I received this book from GoodReads, as it appeared different from other books I have read. My paperback copy published by Two Roads was of very good quality, and I could not wait to get started. I was not disappointed. I found the book absolutely fascinating,and was completely hooked from beginning to end. The author's style is very unobtrusive and easy to read. I enjoy family sagas, and social history, and this book combined the two, and the fact that it is true, just added to its appeal. The photos were an added bonus. I won't say any more, except "Read it, you will enjoy it!" Farangi Girl is a true story of the author's life. Ashley Dartnell was born & raised by her American mother & her British father in Iran. She certainly didn't have an easy life but made the best of the little she had with her two younger brothers. I thought Ashley & her siblings were treated very unfairly by both parents but more so by her mother who seemed to care more about what people thought of her & smoking herself silly constantly. What I loved about this story is that desp Farangi Girl is a true story of the author's life. Ashley Dartnell was born & raised by her American mother & her British father in Iran. She certainly didn't have an easy life but made the best of the little she had with her two younger brothers. I thought Ashley & her siblings were treated very unfairly by both parents but more so by her mother who seemed to care more about what people thought of her & smoking herself silly constantly. What I loved about this story is that despite the poor life Ashley has lived she still went on to make something of herself which just goes to show that a person can do anything if they put their mind to it!! I thought this book was a fantastic read & can't believe it is a first one!! I highly recommend Farangi Girl to anyone that likes autobiographies, non-fiction etc. I was riveted through the first 2/3 of the book, and then it bogged down for me. What kept me going was the descriptions of her college and the people there ... We went to the same school, at about the same time:-). I won this book on a goodreads competition. I can't believe I'd not heard of it before. I'd recommended this to several friends before finishing the book, and then more once I'd finished it. Rather than explain what the book is about (which plenty of people already have) I just want to say that this book kept me interested throughout. A beautiful story, every detail is described perfectly. I was able to put it down and the next time I picked it up, I was straight back into the world of Ashley. If y I won this book on a goodreads competition. I can't believe I'd not heard of it before. Although it is a non-fiction book I found this as easy to read as a fiction book. The way it has been written means it flows and made reading it really enjoyable. The story is detailed, covering life in Iran from the viewpoint of a child and the dynamics of what can only be described as a complicated family. The author describes The characters in a way that makes you really care what happens to them. All in all a very enjoyable, interesting read. An incredible eye opening book. Through the eyes of a child you learn what it was like growing up, through all the rough and tumble. I would recommend this to anyone who would like a break from fiction and to get lost in the life of another. It may not be a completely positive tale but since when has life not had its ups and downs? Thank you for giving me the chance t An incredible eye opening book. Through the eyes of a child you learn what it was like growing up, through all the rough and tumble. Farangi. The stranger. The author paints vivid word pictures of her childhood, growing up in a foreign land with parents who seemed to have no interest in each other and little concern for their children's welfare. The author's skill is to describe Iran, America and her self-absorbed parents with a child's unflinching honesty. Yet what shines through the book is the enjoyment she and her brothers found in their nomadic existence. Having been brought up totally in the UK I was really interested to read Ashley's experiences of life being brought up in a troubled Iran. We all think we've had a tough life but Ashley's brilliant factual story makes me realise just how lucky & easy my life was. To overcome all the problems the family did & to still be of sane mind is amazing. Thank you Ashley for letting me share your family life. Good depiction of expat life both, the good & bad. From an autobiographical view the main character and her siblings had a terrible upbringing. Did feel like her mother had a lot to answer for, in terms of what she exposed them to. But, it also showed how loyal children can be at the way Ashley takes care of her parents when they are elderly. this was a wonderful book!! i was in iran at the same time as Ashley...my story is so different, but the same!! i would recommend this book, if you have lived in iran or not, it is a book about a daughter's story, which is universal and timeless. I found this book engrossing .I have not put It down since it arrived in the post this AM.I could have not lived this sort of life.Not only that but the author came out the other side still loving her paarents i dont think I coujd have been so forgiving. Farangi Girl is a beautiful account of a complex, exciting, and difficult childhood. It examines the relationship between a daughter and her parents as they struggle through poverty and the Iranian Revolution, among a number of other hardships. I really enjoyed this book. It is a memoir, but reads like a novel. I really enjoyed the final chapter that tied all the threads together. I will not say more for risk of spoiling, but I recommend that you read this book! A beautifully written memoir about a complex relationship between mother and daughter. A great read. At times I didn't want to put it down. A daughter's reflection at growing up in Iran and the USA of the 50s, 60s and 70s. Her relationship with her mother and father. A wonderful read. A beautifully written and vividly told story of an atypical upbringing and unconventional parents. I didn't want it to end. I hope the author will be writing more. Well worth the wait to read. I loved this book and it was really hard for me to put it down. A captivating story by an exceptional individual, about growing up in an extraordinary family in a fascinating setting. What's not to like? Taking me a while to get into it... up to Chapter 4. I love it, of course, I wrote it!